Collagen (collagen hydrolysate) is a complex structural protein that maintains strength and flexibility of skin, ligaments, bones, joints, muscles, tendons, gums, teeth, eyes, blood vessels, nails, and hair. Super collagen Type I & III is 100% pure collagen protein that provides building materials for growth and maintenance of a healthy body. when Super Collagen is taken internally, the body receives the raw materials it needs to supplement the collagen found in all of these areas. Super Collagen is enzymatically processed into its amino acid form with a very low molecular weight, which can be utilized 100% by the body. 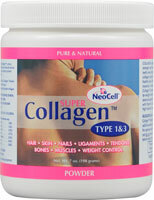 Super Collagen is neutral in taste and specially formulated in an easy to take powdered form. It works synergistically with Vitamin C and it is recommended that it be mixed with orange juice because of its high Vitamin C content or taken along with a Vitamin C supplement. Other Ingredients: Super Collagen Protein derived from 100% pure pharmaceutical food grade collagen. Sucrose, starch, yeast, wheat, corn, cholesterol, fat, and dairy products. As a daily dietary supplement, dissolve one scoop of Super Collagen Dietary Supplement with one spoon of water or orange juice then add 6-8 ounces more liquid, and stir vigorously or use blender for best results. For optimum nutritional benefits, drink as suggested on an empty stomach and do not mix with other protein powders/supplements. Wait 30 minutes before eating. For optimum results use with Pure HA+- hyaluronic acid.